The Jazz Age of the Roaring Twenties put the spotlight on a new sound standing firmly on center-stage. With the rise of this new musical form came a common thread that runs throughout the 1920s: innovation and energy. As with fashion and the characters of the 1920s, the music has often been romanticized and mythologized. It's hard to tell fact from fiction. The fact is the jazz lifestyle was appealing to many. Aloof, hard-edged, passionate and distinctly urban, the jazz musician character appealed to many young white girls and boys hoping to escape the drudgery of rural America. Chicago and New York became the hotbeds of this new music. Jazz quartets were forming all over the country as young boys gathered to listen to new records on windup Victrolas. It was written that everything "in fashion would, sooner or later, be defined as jazz." Jazz was more than a musical style, it was style. The Age of Jazz didn't only occur in the cities. It was as much or more a phenomenon in the small towns where girls and boys smoke, drank, drove fast, and "petted" in the back seats of motorcars. The early 1920s were prime years of flappers; despised by "proper" Middle America, but adored by the major newspapers and magazines of the day. 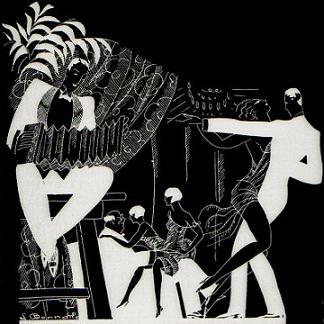 Taking the music out of the equation, you can make a good argument "The Jazz Age" was as much a slick marketing campaign as it was a social revolution. Girls were spending hundreds of dollars the get the right "flapper" look (in the 1920s this was worth upwards of $1000). Make no mistake, there was a revolution happening, both in the music world and with the "New Woman" of The Jazz Age. You just had to look in the right places. The Mould of "The New Woman"
Thanks in large part to young woman like Zelda Sayre (F. Scott Fitzgerald's young bride), Louise Brooks and Lois Long, women were becoming a major force to be reckoned with in popular culture of the 1920s. Smart, witty, brash, and eloquent, these women not only drank and partied just as hard as the men, they also chronicled their experiences as flappers during the Roaring Twenties..
Long was a major reporter for New York's newest magazine, "The New Yorker". She journaled here exploits and adventures as Manhattan's most popular socialite. She was the Carrie Bradshaw of the 1920s, and fleshed out what it meant to experience The Jazz Age. Joshua Zietz writes, "Flapperdom was every bit as much an expression of class aspirations as it was a statement of personal freedom."